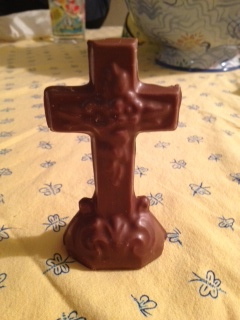 A cross made out of solid chocolate. Blasphemous? Appropriate as we get ready for Easter? I honestly don't know. I do know that is was delicious (yes, I ate the whole thing already). So tell me, since I ate the whole thing, on a Sunday, during Lent, do I have to go to confession? You have to confess how awesome I am .